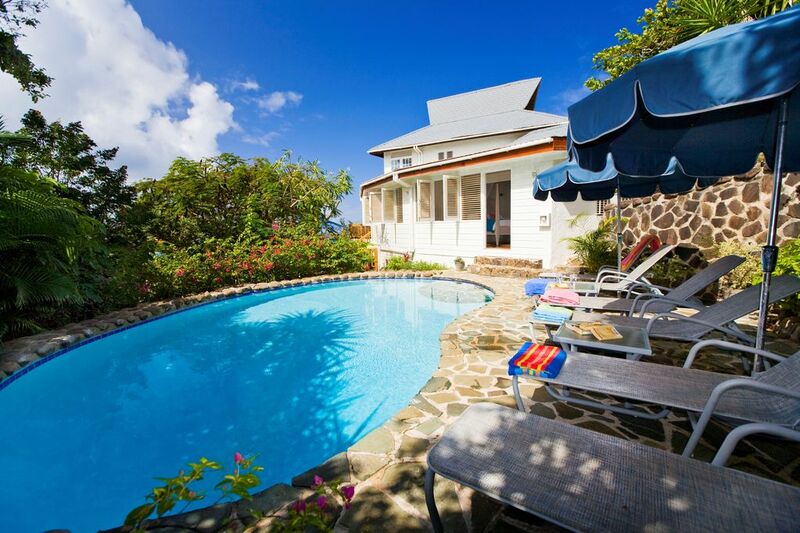 This is a Caribbean style three bedroom, three bathroom house tastefully renovated and refurbished in 1999. The villa enjoys a hillside site with spectacular views of the Caribbean Sea and Rodney Bay, as well as wonderful breezes from the Atlantic Ocean. There is an open-plan kitchen, sitting/dining area. The kitchen has louvre shutters opening to the view. The living/dining area, with two ceiling fans, has louvre doors opening onto a series of patios, all of which are built of natural wood and are situated around and within a flamboyant tree giving the feeling of a treehouse and creating a most attractive and relaxing atmosphere. The treehouse patio has a bridge that leads to the swimming pool, which is surrounded by colourful bougainvillea and tropical plants. There are two double bedrooms on the main living level. Bedroom 1 has two single beds that can be made into a king size bed, with louvre windows that look out towards the flamboyant tree. There is a shower room off of this bedroom. Bedroom 2 has a four poster queen size bed with an en suite shower room. This bedroom has a door that leads to the swimming pool and sun deck. The double master bedroom is at an elevated level. It has a queen size four poster bed and an en suite bathroom with a bath and shower. There is also a private patio off of the bedroom which enjoys a fabulous view all of its own. All of the bedrooms have ceiling fans and mosquito nets.